Do you lubricate your pins? Question: Debbie wrote me asking me to ask you all if you lubricate the pins you have to press to fold or unfold your TravelScoot. She's worried that it might make them collect grime. Please posts your pros and cons in the comment section. I've never lubricated mine but I don't often have to fold my scoot. Thanks! Today was the day that I decided that it was time to take my scooter shopping. Now I guess you are thinking that I've taken it shopping many times before and wondering what could possibly be different about today. Well today is the day that I rode my scooter to the supermarket. 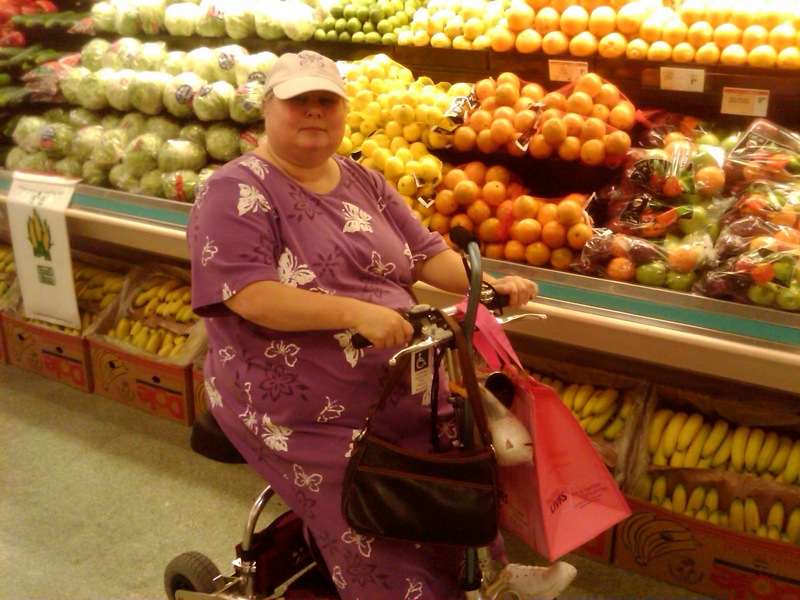 Our Winn Dixie is a couple of miles from my house, so I loaded up my cane and went for a ride. This may have been the most freeing experience I've had yet with my TravelScoot, and it won't be the last. I’ve got arthritis in my hands, knees, ankles, and feet, so I can relate. About the folding pins – they aren’t really cotter pins (I’ve included a picture so you can see just what they look like). I have short hands (6 inches from heel of palm to tip if finger) so you can see just how big the pins are in real life. 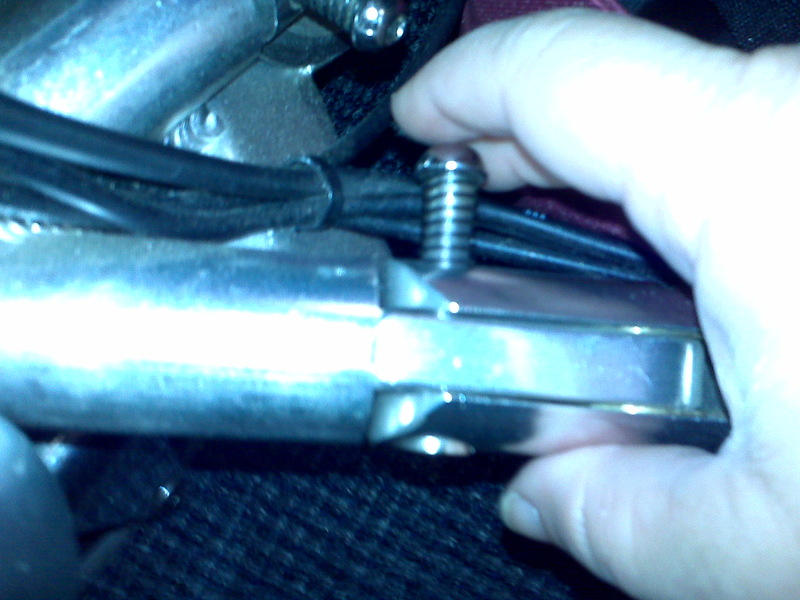 As long as they are lubricated and there is no stress on the joint (sometimes you have to actually put up on the joint a wee touch), they push in fairly well – no small thing to have to grab and then try to fit back into matching holes like with real cotter pins. As for the throttle, I’ve taken to using a crampbuster. I’ve included a picture of the one on Vroom-Vroom and the website. They make two different sizes; I like the long skinny one best as it give more room on the handle for grabbing. By the way, you may find that you don’t have to fold the TS at all. My friend was taking me back to the garage to pick up my Ravi and I couldn’t get the pin in to fold it – remember what I said about lubricating the pin? Anyway, he ended up just picking it up, turning it on its side and putting it in the trunk of his Honda Civic. I am interested in having more information on this blog for people who are interested in the Junior size TravelScoot. If you have a Junior TravelScoot, I would love to know your height and have a picture of you on it. You could be a big help to someone else trying to make a decision. The specifications for the Junior TravelScoot are at http://travelscoot.com/images/full-and-junior-sized-mobility-scooters-travelscoot-small.jpg. Today was about friends and the fun side of owning a TravelScoot. Rhonda, Melissa and I set out to celebrate Rhonda's birthday and break in Melissa's new TravelScoot. Our day started out loading three fully assembled TravelScoots into the back of Melissa's 2006 Toyota Sienna minivan. In this picture my husband Alan is loading my scoot. I have my big lithium ion and a regular size lithium ion battery. Melissa has the SLA battery and Rhonda brought her regular lithium ion. This picture is taken from the side door of the van. 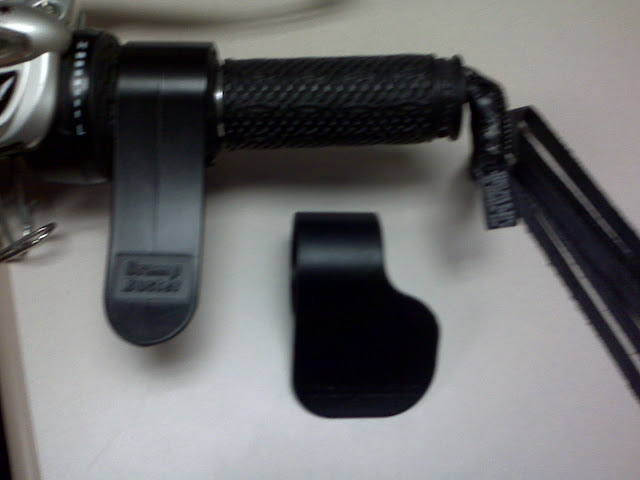 The seat behind the driver's seat folds forward and attaches to the driver seat. That gave us enough room for the third scoot. We drove to downtown Baton Rouge, parked, unloaded and before we'd gone very far, we found our first photo opportunity parked on the side of the street. 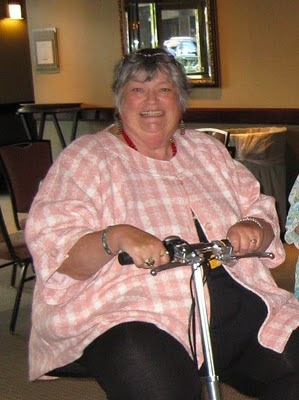 This is what Rhonda wants her scoot to look like when it grows up! Melissa, with the wind blowing through her hair. I hope this picture gives you an idea of the incline Rhonda and Melissa are on. Rhonda is the lightest of the three of us, Melissa is in the middle, and I'm the heaviest. This incline shows how the TravelScoot will perform differently for different weight riders. Melissa and Rhonda are able to drive up this incline with no problem, and they did it multiple times. I can only go about halfway up and have to turn around. This was their first trip to the top. All the way to the top, and now they're coming back down. See the car turning in? We got some great smiles from him as he was getting out of his car. I'm not sure he knew what to think about us. This is Melissa's second time at the top of the hill, and she's getting braver, but NOT as brave as Rhonda. Rhonda's probably been to the top of this hill one too many times, because I swear I heard her say, "Here, hold my earrings!" before I snapped this shot. I love this picture because I took it from somewhere I've never been before, the walkway over River Road. It's a beautiful view on a beautiful day. On the left is the Louisiana Arts and Science Museum and the Planetarium. Click here to read about the day Alan and I visited the LASM. After this shot we ended up riding an elevator to get to another level. I wish I could have gotten a picture of the three of us in one small elevator. It would have been priceless! Here I am in front of the fountain that's in front of the Shaw Center. That's the Mississippi River Bridge in the background. This is the coolest fountain, and yes, we did get a little wet, and I've also spared you the dozens of pictures we took of the fountain at various heights. This was taken inside the Shaw Center. This wonderful view is from inside Tsunami's, a restaurant on the top floor of the Shaw Center. We are looking out at the Mississippi River. We parked two of our TravelScoots on one side of the table. The third TravelScoot is on the other side of the table. Today was the first time I've EVER eaten sushi. It surprised me to find it wasn't as bad as I thought it would be. All this sushi is cooked. The pink stuff in the lower right hand of the picture is pickled ginger, used to cleanse your pallet. I tried a little, and won't be doing that again anytime soon. That was 12 hours ago and I haven't totally lost the taste of it yet. After lunch, we continued our tour of the Shaw Center by checking out the bathroom. I'm babysitting the scoots, and what better to do that take pictures while I wait? A very nice employee of the Shaw Center volunteered to take this picture. Yes, we're still experiencing the novelty of three TravelScoots at once. Maybe we can work out a synchronized scooting routine! After our downtown foray, we decided we needed to look at every single item in Hobby Lobby. As you can imagine, that took hours to do right! My sister Georgia walked in as we were leaving and took the next two wonderful pictures. This is our Mama duck and the baby ducks shot. When we trail along after one another we take turns being Mama duck and leading the way. After Hobby Lobby we checked out the Dollar Tree and Goodwill, then made our final stop of the day at Casa Maria for something icy and cold. Can you help Anne in Cleveland, Ohio? I've read your blog straight through--thanks for putting it up. I'm looking to replace my aging conventional scooter and really intrigued by the TravelScoot's possibilities. I push my scooter hard and take it everywhere, but the idea of a scooter I could lift over a threshhold or up stairs is amazing. I'm itching to just do it, but I really need to see one "in the flesh" before I buy, b/c with RA I have a lot of problems with my hands. I'm particularly worried about what the pins are like to fold and unfold it--sometimes, cotter pins can to be too stiff for me to budge. I'm also wondering whether the throttle will be difficult to work. (I'd love to hear if anyone else with hand problems uses a Travelscoot, and if they modified it). So I was wondering if you could ask your readers if any of them live or will be within striking distance of Cleveland, OH and would let me come drool over their transportation (I'm up for a several hour drive; I really want to see this thing). Tony from Travelscoot is supposed to be asking around for me, too, but he said that a couple weeks ago and I haven't heard back from him, so I thought I'd look for other avenues, too. I talked so much about Melissa's scoot being delivered; I thought you all might want to see a picture of it! This is how it fits in the back of a 2006 Toyota Sienna minivan. I'm going to be doing another post soon where you'll see THREE TravelScoots in the back of this van, and they're all fully assembled. 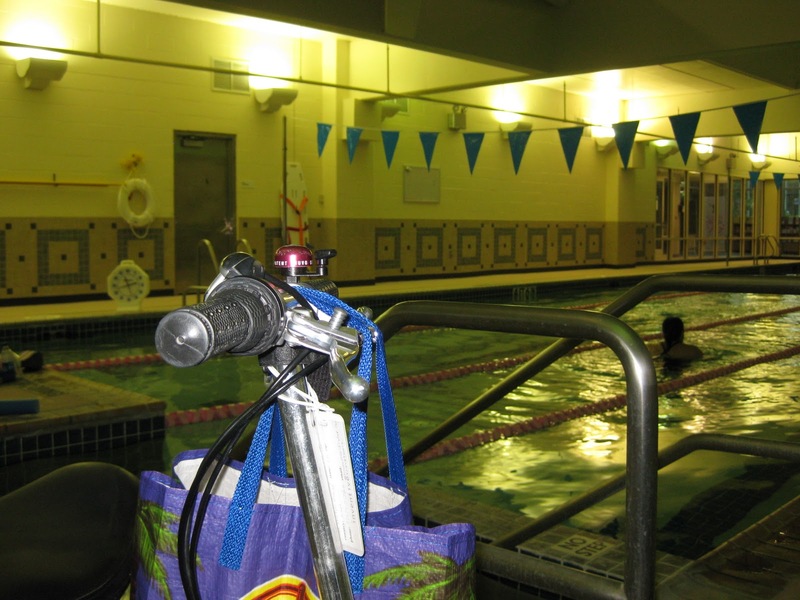 One of the most important things I use my TravelScoot for is to get to the pool for my water aerobics class. Lately I've been dropping by the pool a couple of extra times a week, and there is a measurable difference in how I'm able to move around. This is the pool at the Woman's Fitness Club in Baton Rouge. I love that it has two rails going into the pool. The whirlpool is the same. Anyone else out there using their scoot to get to the pool? Mike rode the travelscoot down a VERY steep incline when he boarded the ferry to the island & on the return trip the scooter got his 260 lbs back up that very steep incline with no problem. The scooter was parked at the back of the ferry. They covered it with tarp so as not to get wet when we took our seats for the 16 min trip. Mike got on the travelscoot & we strolled thru the streets until we reached the Grand Hotel. As we reached the steps to the hotel, Mike got off the travelscoot & I was about to pick it up & carry it up the steps (all 35 lbs of it) when 1 of the attendants came rushing down the steps to help me. He was shocked at how light it was & said wow, this is really a nice scooter & so easy to lift! We toured the hotel & paid for a VERY expensive lunch buffet but I knew Mike wanted to do it & it was a way of experiencing the Grand without paying about $600 a nite to stay there. We did not take it with us on the tour train in Canada as the lady said it was questionable whether we would be able to use it on the trails to the 4 water falls; we stayed in the picnic area. She told us where to park our CRV so when the train pulled up, the handicap car was literally right next to our vehicle for boarding & the same on our return. When Mike retired from the police depart 6yrs ago we were going to travel to all these places we had never been to. Before the cancer & everything else the past 3 yrs, we made it to Niagara Falls, Elvis' Graceland, & the Titanic Museum in Branson, Mo. along with a return trip to Epcot before our last cruise. If we can keep Mike just half way stable we may be able to get in more trips. Trips that would never be possible without the travelscoot. By the way, the steep incline on the ferry was perhaps 20 ft or so, not a great distance but VERY steep & it worked great. I did go to the 1 site you listed & read some of the reviews. I'm not sure what the negative reviewers want from a small scooter. We do not use it as a work horse, we do not expect it to go thru snow, grass, etc. In the winter we drive up to the door of the mall & I carry the scooter to the door & park the car while Mike gets situated. For us it is a light weight scooter that gets Mike from point A to point B and has given us our life back. Last Xmas we shopped for Xmas presents together for the 1st time in 3yrs. We can now do things together and for that I give the Travelscoot an A+. I also don't understand why people say they can't get help when they have problems; we have had NO problems but Mike did call with some questions & talked to the man & had all of his questions answered. If people want some kind of heavy duty work horse then they should purchase a big heavy scooter. So that is my testimonial about the TravelScoot & share our story as you wish. Yesterday was my first DAY in the office and all of my coworkers were very impressed! My former team leader asked if she go for a ride up the row (and of course I let her). I'm not having any trouble getting down the narrow pathways by the windows or in and out of the bathrooms; only 1 area so far has been inaccessible because of the placement of large filing cabinets near a post, but there's another way to get to that area. I'm still not quite successful in getting Poppy in and out of my vehicle without assistance, but the office services folks have said that I can call for help, and one of my coworkers offered to come out to my car to fetch her in the morning. I did succeed in getting her out for the first time on my own yesterday. No such luck at the end of the day when I was worn out. Fortunately for me, a young, strong man emerged from the building and offered assistance. I have been in contact with a local mobility specialist to see what sort of relatively inexpensive lift could be installed behind my seat, and found out today from him that the only one 'legal' that they can do with that configuration is $4,000!! Something to do with safety and crash testing. Well, that is NOT going to happen, as my car isn't even worth that much, so I'm back to engineering plan C (or D, or E, or whatever it will take). For $4000, I could hire a kid to ride shotgun. I wo/uld like to stress, though, that my housemate, a 96 year-oldsight-impaired gentleman, has lifted Poppy in and out with no trouble, so please don't anyone be put off by my challenge. My first ride was much like yours - right here in the house and I was so excited at how easy it was to get around on. Then outside to the driveway where I was amazed at how fast it would go. Don't think I'll ever forget those moments. First experience in a store was at the local mall. Hadn't been there in over a year and I rode up and down the center of it twice and then ventured into the stores. You feel like you just want to shout out to everyone how much fun you're having. I can just imagine how excited Melissa is feeling. My first ride was at when I took it down stairs. Again it was on carpet, so I was bummed, but then I put it in the car and went to the parks with Kathy and our 2 dogs. Eureka! The dogs ran next to me while we went all over the park. They were excited to get to run and I was so happy, you could see the smile on my face next to my ruddy pink cheeks for a mile away. I have been reading your blog for over a year. I found you through the Cruise Critic message boards. 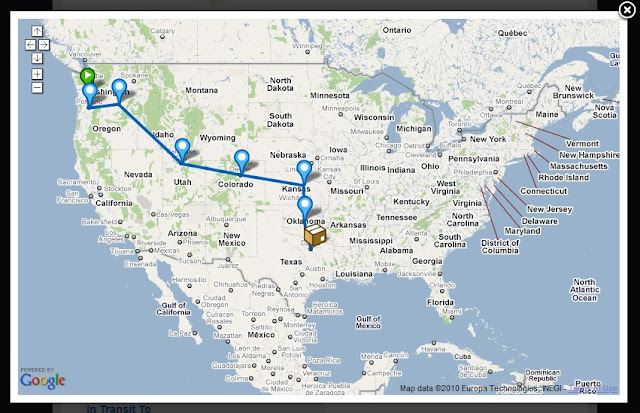 I got my own TravelScoot on Dec 4, 2009. It was a great feeling to have my freedom back after having mobility issues for almost two years. I spent most of August in India. It was my first experience dealing with the Scoot and American Airlines. Other than a surly staff at the gate in Chicago, I was extremely impressed at how I was treated and how the Scoot was handled. In three out of four "legs" of the trip, my Scoot was checked at the gate and I rode it up to the plane or had to leave it at the beginning of the ramp and walked it. Then it would be waiting for me as soon as I left the plane. Chicago to Delhi - they made me break it down completely and tagged it to be checked luggage. Of course, once I got to Delhi, no one had a clue where the poor Scoot might be. It was finally found and all was well. I traveled to India to have bilateral Total Knee Replacement surgery. I didn't use the Scoot much until I left the hospital. My niece and I took a day trip to see the Taj Mahal right before we came home. 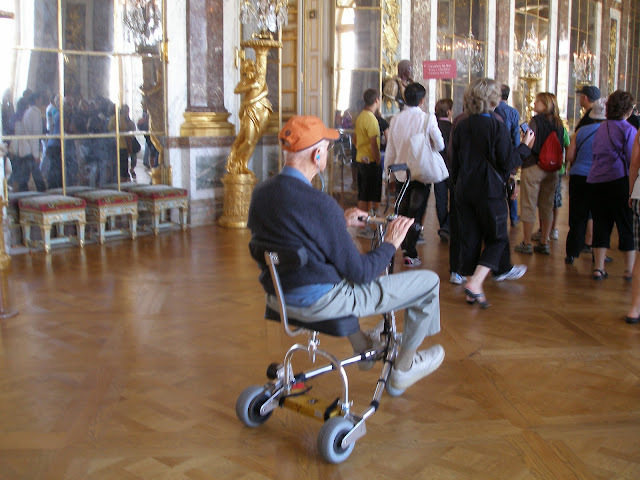 Even though I was walking with a walker and had quite a bit of physical therapy, there was NO WAY I could have done a tour or even made it close to the Taj Mahal without my TravelScoot. Security was not thrilled about letting me into the area on a scooter, but I refused to get up! They had a wheelchair nearby, but I explained to them that I had the Scoot so no one would have to push me around. I think I got more stares that day than I ever have. Thankfully, there were plenty of ramps, and I got some great pictures. I did not go inside to the mosque because of the 15 or so steps. Leaving Delhi was interesting. Me and the TravelScoot went through security three times to get to my gate. I had to break down the Scoot each time so it could be sent through the xray machine, just like carry on luggage. Everyone was so surprised that the Scoot folded up so easily. My new knees came through with flying colors, enabling me to walk through the lines, but they also set off the metal detectors! I have attached a picture of me and my TravelScoot and my niece Corrie at the Taj Mahal. Next she located the battery, which shipped in the same box with the TravelScoot. She decided on the 20-lb. SLA battery, so she could leave it in her car without it being affected by the heat. If you're reading this and don't have your TravelScoot yet, when you plug the battery in do NOT push the connector together until it clicks. It just needs to make contact. You can test it by turning the TravelScoot on, and when you've got a green light, stop. If you push it until it clicks, you may have difficulty getting it unplugged. Right now her battery is charging, and I don't imagine it's going to be long before she takes off on her first adventurous solo ride. If anyone would like to suggest a name for her scoot, I'm sure she'd like that. Do you remember your first ride? Mine was just a few feet across the dining room floor. I was so tentative with the whole thing that I could hardly get the TravelScoot to move. I was convinced it wouldn't go on the floors in my house, so Alan carried it out to the street in front of our house and I tried it out there. The feeling of the wind in my hair was just incredible. I really felt like a kid on Christmas morning, riding that new bike for the first time. My first experience in a store was at a Walgreens. Melissa was with me that night too. I was delighted with being able to stop and look at everything without hurting, but I was a little awkward with it at first. Now it's like an extension of my body. I can fit just about anywhere with it, and I can easily turn it on a dime. 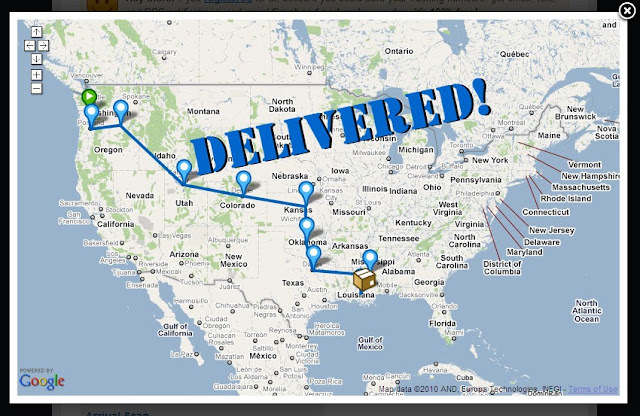 You all will be happy to know that Melissa's TravelScoot arrived in Dallas, TX over the weekend, and is due for delivery in Baton Rouge, LA on Tuesday. I'm 5'11" and 150#. I rented the TravelScoot earlier this month for a cruise in Europe. I had no problems with comfort for my long legs... my only problem was that, because of my disability, I stumbled a bit getting over the triangle/bars (felt like I was playing Chinese jump rope). I got my TravelScoot at the beginning of the year after following your blog for quite a few months. I am 6'1" and at the time I was a pear shaped 400 lbs. When I first got the TravelScoot, getting my legs and feet over the bottom of the frame was my first challenge with it. I had a great deal of difficulty getting on it because my knees seemed to get stuck getting to the correct side of the front column. I felt quite cramped on it and had my mechanical engineer husband looking for ways to modify it. He had an idea about an extension so that the feet bars were lower to the ground, but we never got that far. I was very unhappy and intended to send it back. In brief, I got very very ill and did nothing about sending it back. About 2 months later I had lost about 40 lbs from my illness, most of it in my belly. Once I had gained some strength back I couldn't wait to try my TravelScoot again. Victory!! I fit perfectly. I had no difficulty getting on or off. My knees were comfortably bent. For the last 2 months I have taken my TravelScoot everywhere. It has given me such joy and freedom. So to answer the question about whether tall people can fit comfortably on the TravelScoot, I believe that they can. I think that losing the weight in my belly which gave me more space between me and the front column was key. I no longer feel cramped at all on the scoot. I think each tall person will need to take their body shape into consideration. I wish all you tall folks out there the same comfort that I have on my TravelScoot! I am 6’2” and wish the seat was higher, but I am fine. By raising the seat, the center of gravity would be higher, which would not be good. The seat height is adjustable on the Travelscoot. I am 6 ft 2 inches tall and cannot easily rise from a low seat. There are some sort of ring things (I am not mechanical) that go on the seat post that allow the seat to be higher. I do well with the additional seat height. Since I am so tall I was very pleased that the seat has inserts that can be used to raise it which is much better for me as I have trouble standing. I hope this helps. Katisdale is very active on the forum and I'm sure would respond if asked questions directly. Chris emailed me to ask how tall folks fare with the TravelScoot. She'd spent 4 days reading every post on this blog, and hadn't seen much about taller users. Are you a taller TravelScoot user (5'10" or taller) willing to share your experience? You can post it in a comment here, or send it to me by email, to elizabeth@ifisher.com. I know you're all anxiously awaiting more information about the delivery of Melissa's TravelScoot. 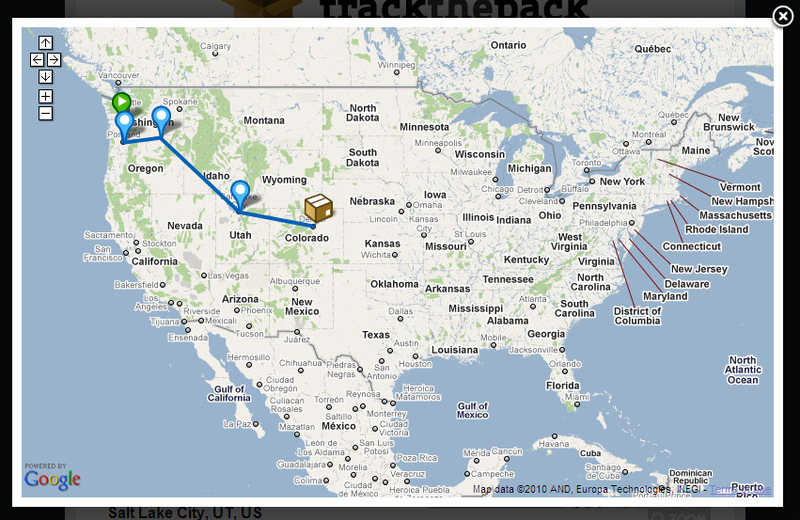 You'll be happy to know that it left Colorado today, headed for Jackson, MS. It's scheduled for delivery next Tuesday. For you iPhone users, you probably already know there's an app for tracking packages. I was able to try it out online. I like it better than the UPS site. Where in the world is Melissa's TravelScoot? 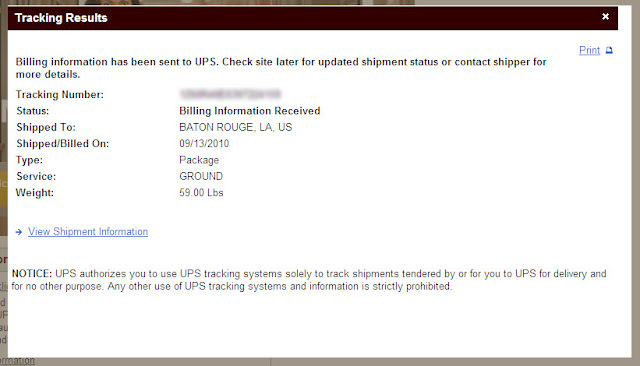 Melissa ordered her TravelScoot yesterday, and reports that she will be following her UPS Tracking Number obsessively. First off, it was interesting that the web site for the con actually told people that if they have trouble walking far to rent a scooter or wheel chair. The con has the rule that if you can’t walk far or go around corners easy, they will get your badge for you. I’ve been in the badge line many times and this is a good thing for those who don’t have their own seat with them or big bulky chairs. I know, I could have taken advantage of them getting my badge for me, but I really wanted to see if I could maneuver through the maze. I’m proud to say that the TS will scoot right along taking the U-turns with no problems. The con people were really nice and helpful for those with mobility problems. There was only one time that I took advantage of their procedure of letting disabled persons in first – when I saw people letting others cut in line. I figured that if others could cut, so could I.
I did get to see one other TS in passing, but as we were going in different directions, we didn’t have a chance to chat. 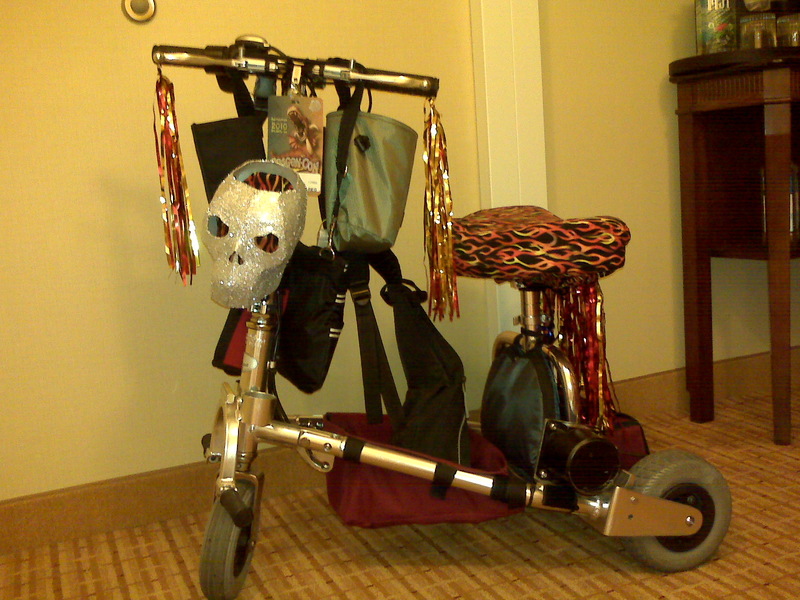 Of course, everyone thought I had the coolest, cutest scooter there. Once they get used to you, the hotel people give up on telling you to slow down. The crazy laughter as you go by may help. Sky walks are fun! Especially the ones that are slanting down in the direction you are going. People usually hug the sides and you can zip by them going, “WHEEEEEEE!! !” Although it is also fun zipping around people as you go by on the up-hill as they struggle along. OK, so I was having too much fun going fast instead of being the poking one. In a con like this, do not be afraid to show off. Zipping around people, doing donuts and figure 8’s to the music lets them know that you are not a stick the mud just because you need a little help getting around. The one thing that is important, don’t forget the bling for the TS! ADA Violation at The Avenue?